Academics are important, BUT they are not the MOST essential component of your young child's education. Although our children's education is important, there are other elements that are just as important, if not more necessary, during their adolescent years. These are the things that will most impact their young lives. A child will learn at his/her own pace. As a homeschool parent you may find yourself comparing your child to those that are attending a brick and mortar school or even against other homeschooled children. Not all children learn in the same way or at the same time. Some may learn to read at the age of 4, while others may not read until they are 8 or 9-years-old. Some children may grasp math facts quickly, and others may be slower at it. If an elementary student doesn't learn something during their elementary years, he/she WILL have another opportunity to learn it later in their education. It is important to remember that since your child is homeschooled, they have the opportunity to learn things at their own pace; meaning whatever they may not learn this year, can be taught and learned the following year. Students DO NOT have to learn everything you feel they "need" to learn in one year. Give them the freedom to learn it at their own level - many times understanding comes with maturity. Children learn better in an environment that is not stressful. If you as their teacher are stressed out, the child will sense it and they in turn will feel the same way. If you need a time-out, take it. Come back and teach when you are in a better frame of mind. It's perfectly fine to take a break when needed, even if it means that not all of the subjects will be covered that day. Just pick up where you left off on the next day. Education at home does NOT have to look like the schooling you received in a brick and mortar school. Beginning homeschool parents are especially susceptible to the idea that their "school" should be the same as that which they attended as a child. Schooling at home is very different. You don't HAVE to use textbooks, and you don't need to set up a "classroom" environment if you don't want to. Homeschooling allows you to have the freedom to educate your children in fun ways. Research the subject of homeschooling to see what other homeschool families' days look like. 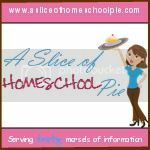 I shared what one of our weeks looked like in A Week in the Life of a Homeschooler. For those with young children, you have plenty of years to teach them. They don't have to know it all by the time they are age 12 or even 18 for that matter. If you do not finish a book, it's okay. Even students who attend public/private schools do not finish a whole textbook in one year. You can spread out what you want your children to learn; it doesn't all have to be mastered within the same year. Concentrate instead in instilling in them an interest in learning. For example, maybe you don't want to teach your child spelling until he/she is in the third grade (even though students in public/private schools may teach it before then). You may want your child to concentrate on the mechanics of writing in their middle school years instead of their elementary years, choosing to save their earlier years for what I call natural writing opportunities, or fun writing. If you believe in our Lord and Savior and know that this is where God wants you to be, know that He will NOT forsake you. Give your worries over to God. Ask Him to fill in any missing gaps and to give you wisdom in knowing how to best teach your child. Be still in knowing that He will be there with you, helping you - all you have to do is continually seek Him. What are some things you find yourself stressing over? If you enjoyed this post, please Pin or Share it now by clicking on the icons below. Don't miss any of my posts. Become a subscriber by clicking on the Bloglovin' button or the RSS button below. I agree with everything here! In fact my mother in law has taught High School French and Spanish for over 30 years. She's now teaching my daughter (who is 10) High School French. My mother in law is so excited because she says she NEVER gets to finish the book with the students. There's 12 units and she has to skip the middle units so that she can get to the end so that the students can be "prepared" for French II. Also, the stress point ~ I'm horrible at teaching my daughter math. I used to make her cry all the time. I found Life of Fred. She is SOARING with math and she says she likes math now and she says she's good at math. She used to say she's bad at math. I do NOTHING with her in regards to math ~ she's all on her own and does well! She even checks her own work! I do believe that the mentality of "having to finish the book" is one of the biggest stresses for homeschool parents. I found it liberating when I learned that schools don't finish their textbooks. Clara, These are such words of wisdom. My children are all grown now and graduated from our home school (and some from college). If you don't mind me adding my two cents. I have found that the single thing that kept me from getting stressed out was to have a routine. Children need a routine and when we, as the home school teacher, don't have one it will create a stressful environment and trickle down into our children's ability to learn. I am not advocating that you violate your #5 Brick and Mortar point, it can still be fun with a routine. We got up at a regular time, got dressed, had a good breakfast and then did school. We were almost always finished by 1:00 PM. And then it was time for fun! My kids loved that they did not need work all day but also knew that it was their responsibility to get their work done. We must remember that the main point of school is to learn. 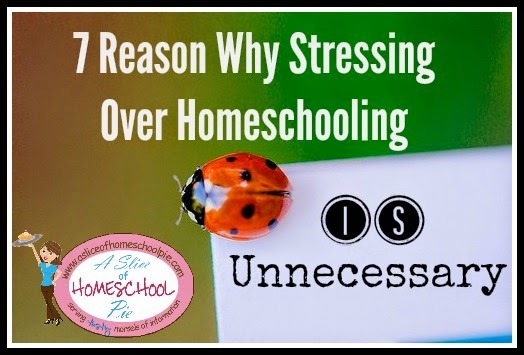 Stress also comes when we forget that sometimes we can have fun learning and that we actually learn so much from "real life" homeschooling. Like taking the kids shopping and letting them know they can have a dollar or two to spend as long as they select something in that price range and are ready to checkout when you are. In this you are teaching the children the "real life" concept of under budget and on time -- very important stewardship principle. Having them help you figure how much drywall tape you need for "x" number of dry wall sheets for your construction project teaches them "real life" algebra. These are just a couple examples of what I remember doing with our kids. Loved this article, thanks so much for sharing. Pamela, thank you for your comment. I completely agree with you that routines are very important. 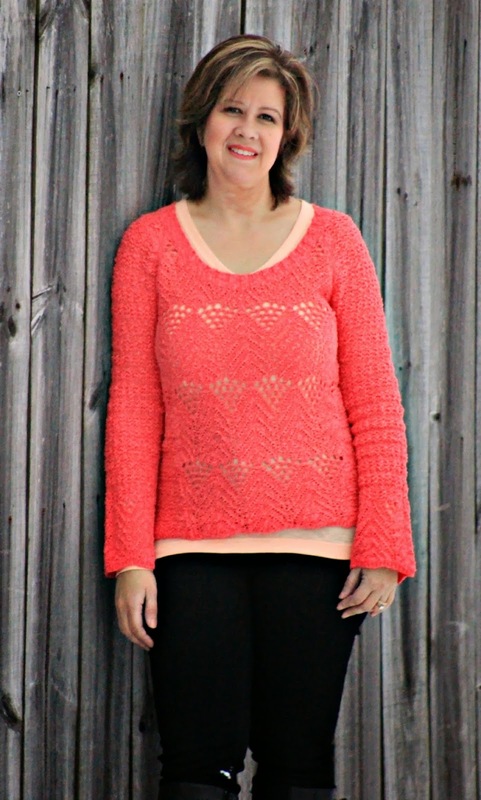 Great addition to my post! As a homeschooling mom of 20+ years I can attest all of this is true! I had one boy learn to read at 4, another at 8. They both are highly intelligent. The one who didn't read until he was 8 was reading on a college level by the 5th grade. But he was my first and I stressed over him learning to read "on time". I shouldn't have! The foundations of relationships and faith are so much more crucial in the younger years. They build a foundation for the teenage years. You will be glad for the foundation later on. Relax! Thank you for sharing your children's experience with us. I have heard of many stories where parents become worried if their children can't read by a "normal" age (whatever age that is) and I am sure your experience will encourage those parents.